Calling all craft beer lovers! Hop on Hawaii's only 15 passenger party bike with folks from around the world! Your guide cranks up the party tunes, rings the bell when it's time to pedal and steers the bike through Honolulu's outstanding arts and warehouse district, KAKA’AKO. 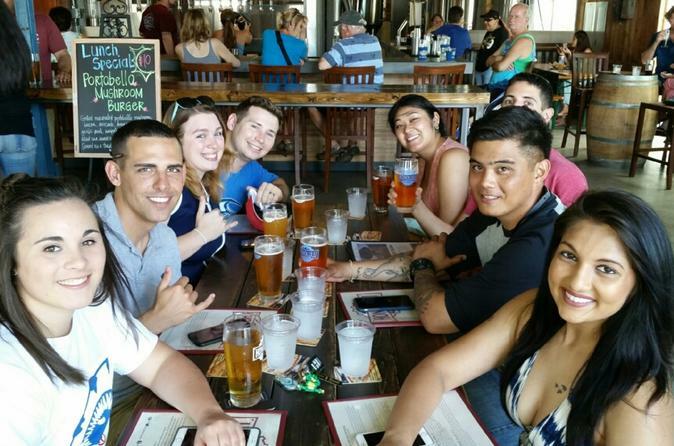 Pedal with your new friends to these local faves: Real a gastropub, Village Bottle Shop & Tasting Room and Honolulu Beerworks.Pay as you go on this 2.5 hour journey through beerpub and time! Do you consider yourself a beer connoisseur? Do you love the taste of craft beer? Well start pedaling away from those wine snobs and sommeliers and hop on Paradise Pedal’s Beer Lover’s tour. The Beer Lover’s tour takes you on Hawaii’s only 15 passenger party bike with fellow beer cicerones from around the world. Pedal through the craft beer mecca of Kaka’ako a unique opportunity in Honolulu truly unlike any other. Since the economic recession of 2008, artists from all across the United States and Asia have flocked to the neighborhood of Kaka’ako to create stunning works of arts all throughout the warehouse walls that surround the neighborhood. So, what are you waiting for? Get onboard and start pedaling through this cheeky neighborhood where you are miles away from merlot and steps away from Honolulu’s local faves like Real a gastropub and Honolulu Beerworks!